Combine all the ingredients except the canola oil in a large bowl, blending gently but thoroughly. Form a patty with about 1 ounce of the mixture to make a tester to taste. Heat a small saute pan over medium heat, add a small amount of canola oil and saute the meat. Cool and taste for salt and pepper. Adjust seasonings as needed then shape the meat into 1 inch balls and chill for 1 hour. Heat a large saute pan over medium high heat, add enough canola oil to lightly coat the bottom of the pan. Add the meat balls and brown on all sides. Remove and place on a baking sheet, continue cooking until all the meatballs are browned. Preheat an oven to 375 degrees. Bake the browned meatballs until cooked through about 5-6 minutes. Remove from oven and serve. 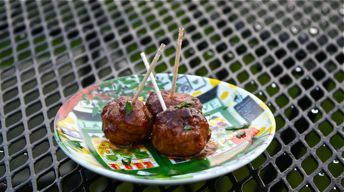 You can brown the meatballs early in the day, refrigerate, then bake when ready to serve.